SAL DeTRAGLIA'S VIRTUAL TAPAS BAR: LADIES AND GENTLEMEN…THE GYPSY KINGS! Purely for comic relief (and also because today is Friday), I’ve decided to introduce this photo into the public domain. 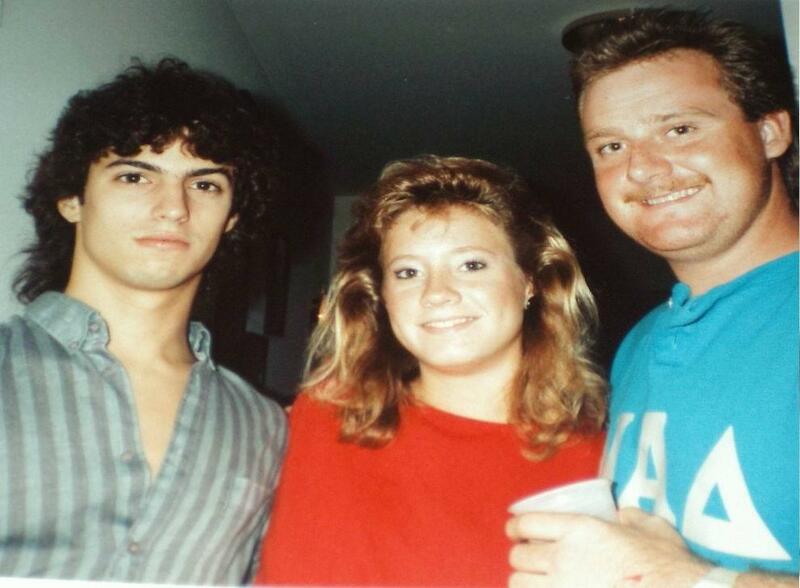 That jive-turkey mafioso on the left is—or shall I say, was—me in 1986. It was taken during my sophomore year at Northern Illinois University (GO HUSKIES!) during a Friday night off-campus party. I’ll keep the names of my two companions under wraps, so that they don’t sue me for intentional infliction of public humiliation. But THEY know who they are. I believe this photo is notable as much for the vast quantity of hair on my head, as for the embarrassing lack thereof on my chest. My-oh-my, how the tables have turned twenty years later. BTW…the curls weren’t natural. But you’ve probably already figured that out. Comedy aside, there is an eerie element of foreshadowing in this photo. Isn’t it inevitable that a guy who looked like a flamenco singer in 1986 should be living in Spain in 2005? You look so dang serious - just like your current photo! Your friends are smiling - what is wrong with you?? Everybody asks me the same question, "Why don't you smile for photos." - "I'm smiling on the inside." - "Much can go wrong with a smile, whereas a straight face is always consistent." - "Oh...but I just *ADORE* Buster Keaton!" - "I'll smile when Abe Vigoda starts returning my calls." Lies, lies, all lies. The real reason that I don't smile for photos is one of necessity: The camera's flash would reflect off my dazzling-white teeth and ruin the photo. As for my "attorney face"...I don't allow photographers to see it, because it requires me to drop my pants first. But I can understand why you might've confused it with the photo above. Ah, flamenco singers--or dancers. No wonder the women in Spain use fans. Too hot to handle. That's odd. They use them as fly-swatters when I walk by. AN EVENING IN THE DOGHOUSE.